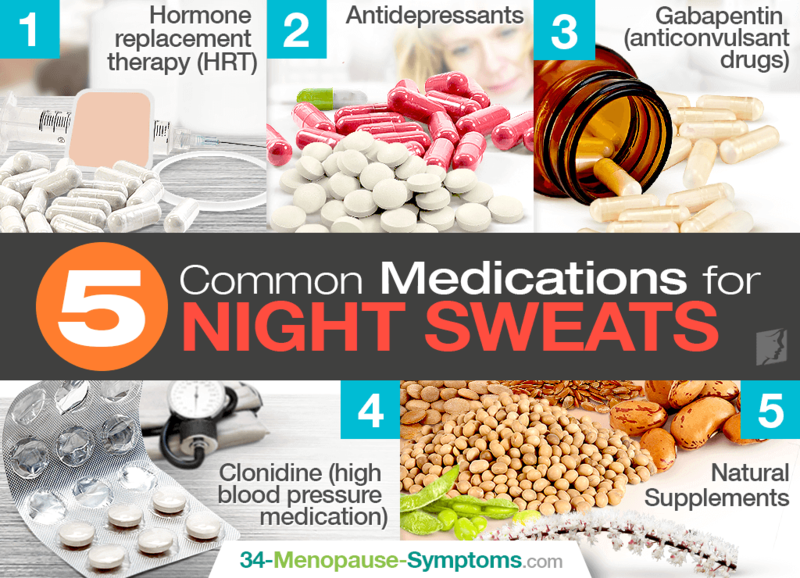 Like many menopausal symptoms, night sweats can be treated with a natural or conventional medical approach. When considering your options for decreasing, or even preventing future night sweats, it can be helpful to know which treatments other women have found successful. Find out more about some of the most popular medication for night sweats to better enable you to make an informed decision about which route would suit you best. HRT is probably the most well-known medical treatment for all menopausal symptoms. It is available in a few different forms, all of which are designed to artificially increase the levels of reproductive hormones in the body, which decrease during menopause. This action can greatly reduce a number of side effects that occur during this stage of a woman's life - including night sweats. It should be noted; however, that HRT can have some serious side effects such as increasing the risk of blood clots and cancer, and so it is important to thoroughly discuss this option with your doctor before embarking on the treatment. These were administered to woman who are prone to night sweats, and the results showed that the medications were able to significantly lower the frequency of episodes. However, antidepressants can have undesirable side effects such as nausea, insomnia, and anxiety among others, and so it is advisable to seek advice from your doctor about this option. Clinical trials have also found Gabapentin to be helpful in the treatment of menopausal night sweats. This medication is predominantly used to control seizures in sufferers of epilepsy, and for treating pain caused by nerve damage; however, it has been provided to women for the purpose of reducing night sweats and sleep disturbances - for which it was found successful. Common negative reactions to Gabapentin include drowsiness, fever, and a viral infection. Another unconventional option is Clonidine - commonly prescribed to sufferers of high blood pressure. It is thought that a chemical within this drug can increase the threshold for body temperature before the inducement of sweat. In one study, the medication lowered the incidence of hot flashes by 20%. Side effects of clonidine might be dizziness, irritability, and headaches. When considering the kind of medication - if any - you might respond well to, it is important to evaluate all of your options. The above are five of the most common, but they are not your only choices - talk to your doctor about alternative treatments if you are unsure. More than three-quarters of all women will suffer from night sweats during their life. Click here to learn why.